Do you have a book that you read and reread more often then anything else (besides novels you've written!) ? If you could go on a book tour anywhere in the world for one or all of your books, where would it be? Are your children of an age that they can enjoy your books? Even if you just ramble on about editing your books and what you do to get inspiration would be great for blog entires too! I'm still wondering who Minho is named after? How did you make such soul-sucking scenes such as (Spoiler of Scorch Trials) When Thomas is betrayed by Theresa. I am an aspiring author that loves your writing. How many words/hours a day do you write? As you'll be in San Diego for Comic Con - do you have plans to make appearances anywhere else in the area? Like a local library? I HAVE A QUESTION! !can you visit my blog? and become a follower? Hey Mr. Dashner! I just can't stop thinking about the 2 best books in the world. I know doing comparisons to books is a bad idea, but it also sums up how amazing The Death Cure is. I compare it to The Hunger Games for position number 1!! I just can't decide. But I do have to say, the Death Cure did made me read up to 4 in the morning, and then cry towards the very end. I won't reveal it, but I loved/hated the part where the last person to die, gets crushed.. Best writing I've seen out of plenty of authors. I cannot wait to meet you at IRA in Illinois! My question is : How did write your first book? Like did you write it on paper napkins ( The very rare, but seen way :P ), write it in a composition notebook, type it up, etc. Then what did you do with it, to make it into the final manuscript. I'm curious becuase I love writing and reading, and during school hours and sometimes at home, I open up my composition notebook, and just continue with my so called "novels". I don't know what to do with my writing, to get it from a jornal, to a manuscript. How did you become such a good writer? Do you spend time (beyond the blog) writing every day? Do you think part of becoming a good writer is through reading a lot? Does writing become a chore when it's your job? Do you have to change your ideas to conform to publishers desires? Are you subject to their every whim when you're published on a national scale? How in the world do you create dialogue and deep characters? That's hard! Do you listen to others' conversations or do you watch people and observe their mannerisms? I'm sure I've overloaded you with questions, but you asked for it! :) Thanks in advance for any insights into these questions I've asked! 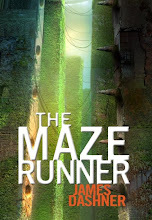 On the top of the UK covers for The Maze Runner books it says 'For fans of Gone' (Maze Runner) and 'For fans of The Hunger Games' (Scorch Trails). Do you have any say over this or do the publishers just stick it on? I read Gone myself after I read Maze Runner because it was on the book cover. I really enjoyed it too. Do you regret killing Newt off as you made all your fans cry over him. Did you know Newt was so loved by fans? You once put in a good word for Divergent by Veronica Roth. If Thomas lived in that world, which faction would he have picked? Hi Mr. Dashner I just visited Goodreads and I found your new blog post. I just want to ask where did you get those "terminologies" such as klunk, shuck, and slinthead in the Maze Runner? ( are the words patented? Hehe) And why did you choose a young adult genre among the others? Thank you so much and good luck for your film. I have a question that has been nagging me for a while (maybe just a day). My friend and I were discussing your books when a question arose, and maybe we both just skipped a page, but the question is still there nonetheless. In scorch trials, what is the purpose of the box that Teresa put Thomas in? we spent about 30 minutes theorizing about that one thing, and we couldn't come up with anything that made sense.... if you could explain i would be extremely grateful. I have been wondering about this for a while,so here it is. Since they were all named after people and they got their memories back, what was Thomas's real name? Hey i was wondering if there is someone actually making a movie based off The Maze Runner, And if you have anything to do with the production of the movie. P.S. I would also like to thank you a lot for inspiring me to start writing. Is the podcast ever coming back? I know you're very busy, but just a "probably" or "eventually" would be nice! Also, if your book tours are not set in stone... The Nashville area would love for you to come!!! Any news about the movie??? 1. Who is Chuck named after? 2.Chunky's comment "...Would you choose Teresa or Brenda?" Why. When is the fourth book for the thirteenth reality coming out do you know??? Who is Minho named after? And will you be releasing any "Excerpts" of The Kill Order before you release the book to keep us from losing our minds with impatience? And if you could pick one event from your books that you absolutely favor from other scenes what would it be? Thank you. Do you think you'll have a book tour around Canada? (Preferably around Picton/Napanee although Toronto would work too...) because I know people up north LOVE your books too! I just finished reading the Death Cure and it was SO. FREAKING. AMAZING. THANKYOUTHANKYOUTHANKYOU for ending your trilogy with such a FANTASTIC story. I loved EVERYTHING about it, especially how it wasn't all rainbows and puppies at the end. You had such original and creative ideas, bless you James Dashner! I'd really love to know how Thomas and Minho and the rest of the gang turn out in their new and improved civilization. Any hints? I am a reader from Asia and I love Minho. Thank you for creating such an amazing story. I don't have a question, but I'm listening to the Death Cure on audio book and enjoying it. What was your inspiration to begin writing the stories that you did? I've followed your 13th Reality series ever since it was released in 2008. As I understood it, it was a five-book deal w/ Shadow Mountain. Was this merely heresay, and was it always four books, or did something change? If it did, why? 1.Why was Thomas SO SO SO SO SO angry with Teresa? 2. After everything they've been through, why did Thomas not give Teresa a second thought after she died? 3. How's the movie coming? As you can see, I am clearly Team Teresa. I call Brenda a Teresa-wannabe! :) Hahaha! Your book "The Maze Runner" was the winner of the Grand Canyon Reader Award for 2012. Votes were just tallied this week. If possible, can you contact me about possibly coming to the library conference to receive your award and be part of an author panel. The conference is in November, 2012 in Phoenix. Thank you and congratulations. Where is Newt from? I always thought he was British, but it never says.